PACKAGE THIS TITLE WITH OUR 2016 MLA SUPPLEMENT, Documenting Sources in MLA Style (package ISBN-13: 9781319084523). Get the most recent updates on MLA citation in a convenient, 40-page resource based on The MLA Handbook, 8th Edition, with plenty of models. Browse our catalog or contact your representative for a full listing of updated titles and packages, or to request a custom ISBN. 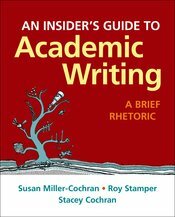 Based on the best practices of one of the most innovative and productive first-year composition programs in the U.S., An Insider’s Guide to Academic Writing: A Brief Rhetoric is the ideal way to prepare students no matter which discipline they are entering. Through a series of flexible, transferable frameworks and concrete connections to the disciplines—including unique Insider’s video interviews with scholars and peers—it helps students use a rhetorical lens to adapt to the academic writing tasks of different disciplinary discourse communities. In addition to this brief, rhetoric-only version, The Insider’s Guide is also available with a thematic reader that foregrounds real readings from the disciplines. Use ISBN 978-1-319-02030-9 for this version without readings.